Manager of the team Cassita Pollard said on Wednesday that the Vitamalt Trail Blazers netball team placed second in the 2014 Owia/Point Village Community Partnership Group Netball Tournament, while their participation was made possible through sponsorship from the Brewery through Vitamalt. The Brewery provided the teamâs uniforms and banner. âI would like to take this opportunity to thank the Brewery. Your support of sponsorship towards participating in the tournament was greatly appreciated and we were not without success, as we placed 2nd in the competition,â said Pollard. The tournament, which began on August 16, had six teams participating. 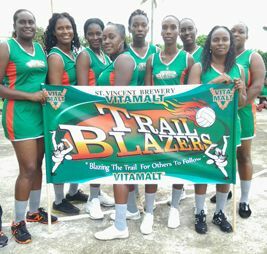 The Vitamalt Trail Blazers lost 31-43 to the Young Strugglers during the finals of the competition, which was held last Sunday, September 7. Pollard said that she is looking forward to continued support from Vitamalt for the 2015 season.